WASHINGTON — The Second Vatican Council continues to have an enduring impact on the Catholic Church and on the papacy of Pope Francis, according to the Vatican’s top diplomat, Cardinal Pietro Parolin. That gathering of bishops from around the world presented a new paradigm of a “world church — a church with a global dimension,” said the cardinal, who is the Vatican’s secretary of state. Cardinal Donald W. Wuerl of Washington, Catholic University’s chancellor, offered an invocation and then introduced Cardinal Parolin. He noted the prelate is known as an expert in Mideast affairs who was responsible for efforts bringing Israelis and Palestinians together for peace talks. In Asia, Cardinal Parolin also was instrumental in efforts to build up ties between the Vatican and Vietnam, Cardinal Wuerl said. 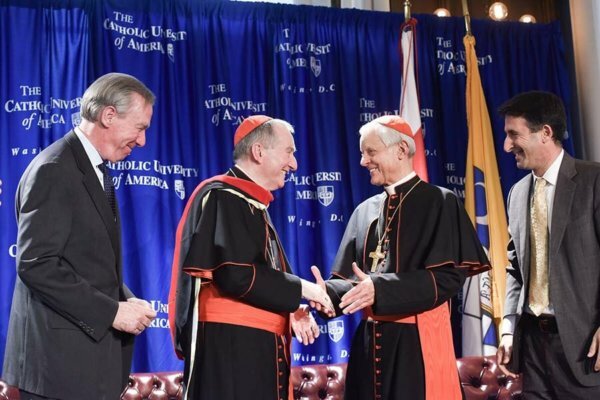 “In this whole process, Cardinal Parolin has always been able to put the face of the church and the face of Christ’s love into diplomatic action,” Cardinal Wuerl said. Cardinal Parolin spoke to the Catholic University audience in Italian, while a translation in English appeared on video screens via closed captioning. Those in attendance included university administrators, faculty members and students. Guests included Archbishop Christophe Pierre, apostolic nuncio to the United States. The Vatican II fathers also emphasized the importance of the Catholic Church identifying with the poor, said Cardinal Parolin, who quoted a section of Pope Francis’ “The Joy of the Gospel” emphasizing the pope’s often-stated desire for a church that is poor and for the poor.